Protect your child through vaccination! Your child’s growth should not be hindered by health problems. Therefore, it is important to get your kid vaccinated during their childhood for different life-altering diseases such as polio, hepatitis, measles and more. For getting the child immunized at the right time, you need to maintain a schedule, and an immunization chart helps you in this regard. MomJunction has come up with an easy-to-use Immunization Scheduler, which you can personalize. The best thing you can also download a printable version of the immunization schedule. Enter your child’s birth date, and you will receive a personalized child immunization schedule from birth until they reach 12 years. The immunization scheduler and chart is based on the recommendations of World Health Organization (WHO), which monitors vaccination schedules across the world. Some vaccines are optional but some are mandatory. But, as parents you might want to know if vaccines are good for your baby. Are Vaccines Safe Or Can They Be Dangerous? Vaccines are usually safe as the benefits far outweigh the risks. Most babies do not have any significant problems, but some may develop specific side effects to some vaccines. Side effects are minor and usually disappear within a couple of days (2). 1. For DTaP/DTwP, IPV, PCV, Hib vaccines, your child may get mild fever, redness or swelling at the injection site, diarrhea, or vomiting. They might appear within 24 hours of vaccination. 2. MMR vaccine causes mild side effects after six to ten days of vaccination. Your child might have a slight fever, aversion to food and measles-like rashes. Do not panic if your baby has a rash as it is just a reaction as the body starts to build immunity against the MMR virus. 3. All vaccinations can cause a fever, and in some cases, young children might develop seizures or convulsions with high temperature. In this case, consult your doctor. 4. Though rare, there is also a chance of your child developing severe allergic reaction known as anaphylaxis. In this case, your child will contract allergy symptoms, such as rash, swollen lips or face, breathing issues and vomiting, within ten minutes of vaccination. Mild side effects are alright, and disappear in a few days. But if you see your child suffering too much, do not ever hesitate to talk to a doctor. 1. Why does my baby require vaccination? 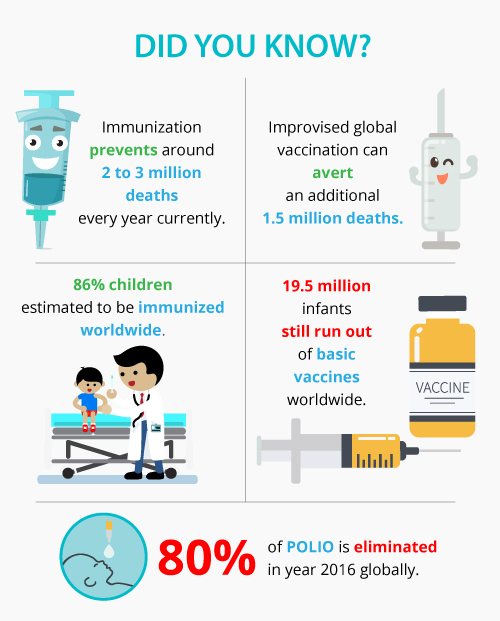 Vaccination provides immunity (defense) against potentially dangerous diseases. It also prevents the spread of infections such as polio, measles, hepatitis and more. Additional shots are also needed in some cases to offer full immunity to specific diseases (3). Vaccines are dead or weakened versions of the disease-causing virus. As they are injected into the child, the body system produces antibodies to fight the disease and develops immunity. It thus keeps a record of it in the immune system and can quickly deal with similar attacks in future (4). 3. When should your baby get vaccines? MomJunction provides you a detailed immunization chart of your child’s vaccination schedule. The first two years vaccines are given in the months 2, 4, 6, 9, 12, 15, 18 and 24. Your baby will get around 10 different vaccinations (in 25 shots) before they reach two. They will be receiving booster shots for some diseases such as MMR, tetanus, diphtheria, chicken pox, pertussis (DTaP) and polio before they reach four years of age, i.e., around school-time. Your child will receive some other vaccines such as HPV and meningitis in their teens (5). 4. Can getting more than one vaccination at once overload your child's immune system? It provides them protection during the unsafe early months. Several shots at a time mean fewer hospital visits. It saves both money and time and can be less painful for the child. Research says that getting multiple vaccines at a time is safe and does not cause any chronic health issues. The recommended vaccinations are active when given individually or in combination. Sometimes, combinations can cause a fever or convulsions, but do not result in any widespread damage (6). 5. What if your baby misses any vaccination dose? Make a quick appointment with the pediatrician, and you can usually continue the schedule from where it stopped. But remember that although it is possible to make up for the missed vaccines, it is still not safe to postpone shots schedule for kids. They may not be fully protected from certain preventable diseases. In some cases, the doctor will advise a blood test for your baby around two months after the vaccination to assess their body’s response to a particular vaccine. Therefore, it is better not to miss the schedules dates (7). Disclaimer: The information provided is based on the World Health Organization (WHO) which gives information on worldwide immunization schedules. It provides the usually recommended dates for vaccinations based on the country you are living and baby’s birth date. No information about your child will be stored. If your child is having any disease or is under any treatment, you should consult your doctor for advice as the immunization schedule would be modified.